I could rattle on all day about how great RegexBuddy is. But do not take my word for it! Find out what the people say about RegexBuddy before you decide to buy it. "RegexBuddy is to regex what the pocket calculator was to arithmetic. And the painstaking improvements in ‘flavors’ is admirable." "This is one of those very rare programs that makes me laugh—a different sort of laugh, that shake your head and grin laugh—for the mysterious reason that is a combination of intrigue for the subject and respect for those articulating it. Having studied Jeffrey’s book I thought, “Ok, now…gasp…it’s time to start using all this.” But with RegexBuddy I have basically no fear. Oddly, not because the program “does it for me,” (even with RegexMagic) but because I can co-discover with the program what I’m trying to say “in Regex.” Thus, I play, I learn. I need a regex for a meta function on a website, I learn. 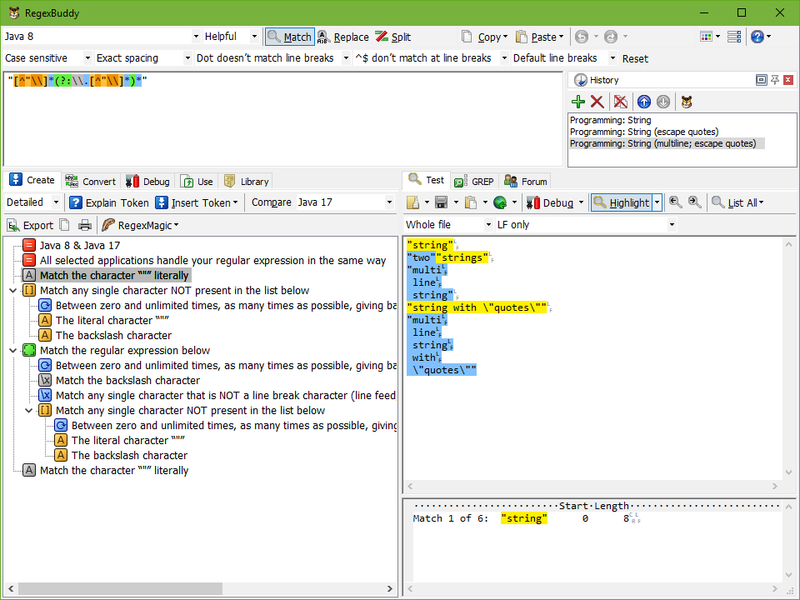 It is to regex what the best language learning courses are to natural language. "I guess I gotta say using this is something of a thrill. And for my part, much safer than roller coasters." "My done code so far can be clearly divided into pre and post RegexBuddy times. I knew all about regexes before and used them if needed, but without RegexBuddy, debugging took longer than writing code. After buying RegexBuddy I use regexes wherever useful, reduce code and finally have time for real business logic." "I bought RegexBuddy 5 years ago. I think there are less than 30 working days than since, that I did not use it. I got all the free updates/bugfixes over the years and finally asked myself: WHY? I was more than willing to pay for updates after two years or so but it was always free. This is really fair and best practice for consumer satisfaction. "As a coder I know that a software is never 'finished'. But I always thought that regexbuddy 3 is as closed as possible to this state. When I got your mail about version 4 I was surprised. You really managed to add THIS lot of valuable things under the hood; leaving the interface intact—I am really impressed. Coding is one thing, concurrently knowing about UX a complete other."